� 30.11.2005 - Tourists welcomed to SA's "Cradle of Humankind"
afrol News, 27 October - Gradually, the South African government is eradicating symbols from the apartheid era, twelve years after the racist system faced out in Africa's youngest and most vibrant democratic country. Now, the Johannesburg airport is to change its name. The African National Congress (ANC) government is changing the names of several of the country's cities and structures that bear perpetrators of apartheid. They are replacing them with names of those who played a lead role in the fight against minority white repressive rule. Apart from changing the name of its capital from Pretoria to Tshwane, the South African government today officially changed the name of Johannesburg International Airport to OR Tambo International Airport. Oliver Tambo and other liberation fighters stood against the former apartheid government's policy of racial segregation. He ruled the ANC - then an outlawed group - from 1967 to 1991. At the naming ceremony, Transport Minister Jeff Radebe urged South Africans not to forget the significant contribution that Mr Tambo had made to the realisation of the country's democracy. He defended the reasons for naming the airport after an icon of liberation struggle. "We are truly delighted that this icon of the liberation struggle, the architect of our new democracy has his name enshrined forever in the minds and hearts of all peace-loving people in the world. Our people simply loved OR - all of us in the ANC, even enemies as well, agree that this was a great son of African soil," Minister Radebe said. The widow of Mr Tambo, Adelaide Tambo, received the news with delight, saying her late husband deserved to lend his name to South Africa's - and even Africa's - main airport. Mr Tambo and Nelson Mandela were among a small group of political activists who founded the African National Congress Youth League in 1944. As a teacher, Mr Tambo taught for several years at St Peter's Secondary School in Johannesburg before joining a law firm in 1948. Mr Tambo and Mr Mandela founded the first black law practice in South Africa. Mr Tambo was arrested in 1956 on charges of treason but was released a year later. He rose through the ranks in ANC - becoming its Secretary General and Deputy President in 1955 and 1958 respectively. Two years later, the white government outlawed the ANC, thus forcing Mr Tambo to leave for exile. While in his exile home of Zambia, Mr Tambo became Acting President of ANC. And after the death of ANC President Albert John Luthuli in 1967, he led the ANC. However, following an illness, Mr Tambo passed the leadership baton to Nelson Mandel in 1991, who emerged from 27 years of prison the year before. 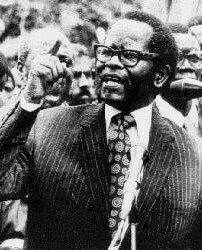 Mr Tambo died in April 1993, following a stroke.